In 1975 John Batdorf headlined a concert as Batdorf & Rodney in the Lubbock Municipal Coliseum. Opening for them that night was Junior Vasquez and Peyote. Many of you were at that concert. 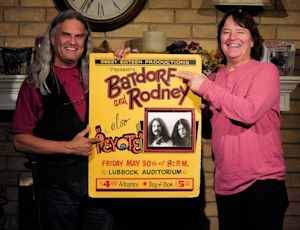 If you loved the Eagles, Crosby Stills & Nash, and America, you should know that Batdorf and Rodney were part of that whole music scene. Now 40 years later, history has repeated itself, as John Batdorf again headlined a Lubbock concert, which again was opened by Junior Vasquez. These two great musicians have each evolved over the years, but their music remains as complimentary as ever. This is the first HubCityMusic.com house concert to ever have an opening act. The weather outside was frightful – snow and freezing sleet all afternoon the day of the show. But the fans braved the weather and showed up anyway, and John and Junior provided a magical evening of music and conversation. For Junior Vasquez, this was a rare opportunity to perform all original songs, and he showed that his songwriting ability is as polished and professional as his singing and guitar work. And when John Batdorf took the stage he demonstrated a commitment to excellence in vocals and guitar play that is second to none. Seriously, you won’t hear a more flawless performance than John delivered on that snowy night in the warmth of our living room. Watch this page for videos from this concert, to be posted soon. Click here to see our previous post about John Batdorf.